Happy 4th of July!…a little early. For the month of July, Learning for Life Online will higlight tools that help with party and travel planning. From holiday BBQs to potlucks to block parties, from a day trip to a two-week vacation, online tools can make organizing people and things easy as pie. For those last-minute recipes for 4th of July cookouts, let’s start with the best recipe-finder I’ve seen: Yummly. Yummly is a specialized search engine just for recipes. You type in words to search for – “avocado salad” – and then let Yummly deliver you hundreds of recipes that match those terms. That would be useful enough, but Yummly uses limits – called facets – to let you narrow the list of results down to exactly what you’re looking for. Use the top two fields to find recipes that do or do not have specific ingredients by typing next to the minus or plus signs. Click on and slide the grey dots under Taste to choose the flavors in your recipes. Like salty food? Slide the Salty facet over to the right. Hate Spicy food? Slide the Spicy facet all the way to the left. Leave any that you don’t care as much about in the middle at No Preference. Blow these facets, click on the boxes next to Allergies and Diets to find recipes that are good for people with those needs, and use the sliders under Nutrition to find healthier options. Other limit options include specific budgets, courses, time you to prepare, holidays and more. 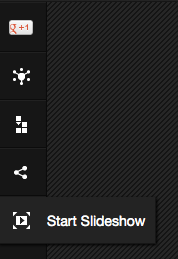 For all of these facets, click on the box or pull the slider to change the option, then click again or pull the slider another way to change them back. You don’t need to redo your search or use the Back button to get back to where you were. The search results down the middle of the screen list the ingredients for easy choosing, and each recipe has a star rating for quality. Click on a dish to see the whole recipe with instructions and nutritional information. Email yourself the recipe for later use, or print it out. You can do all of this without signing in or creating an account, but if you set up a Yummly account, you can also Favorite and Save recipes, add ratings, and do many other things. Just imagine: you’re cooking dinner for 6 friends, one of whom is a vegetarian and another who has a gluten allergy. You are allergic to tomatoes. You’re serving roast chicken, but you need help with the side dishes and an entree for your vegetarian friend. Search on the word “pasta” or “salad,” then use the facets to find vegetarian gluten-free recipes to complete your menu. Add any ingredients you have already, and exclude anything with tomatoes in them. What would have taken many searches using different recipe sources online (like Epicurious or Food Network) happens in minutes using Yummly. Cooking for the 4th? Or just looking for some new ideas? Search for your favorite kind of food and use the facets to quickly limit the results down to exactly what you’re looking for. If you find a great recipe, share the link in the comments below! If you really want to use Yummly as an online kitchen helper, sign up for an account. It seems there’s more to come from Yummly. Check out this article from Forbes magazine. This entry was posted in This Week on LLO, Tips for Living Life Online, Tools and tagged finding stuff online, recipes, searching, yummly on July 2, 2012 by Jennifer Koerber. For our last May post, let’s look at a pair of online tools that could be useful if you’re traveling over the summer: an online map that shows you not just the streets, but the view as you drive down them; and a series of guided tours to a variety of art museums and galleries from around the world. Google Street View is a feature of Google Maps that will let you see what would be around you as you drive a route you’ve plotted out on a map. Several years ago, Google began driving vans with 360-degree cameras on top through major cities and towns, recording the view from the street. Then, they connected these street views to Google Maps, so that travelers could see what was around them as they drove or walked from place to place. Now, all you have to do is visit Google Maps, type in an address or get directions, and then use Street View to see what the route will look like when you’re there. Google Art Project takes the technology created for Street View and brings it inside a growing number of art museums and galleries. Using the Google Art Project, you can “visit” a gallery from the comfort of your computer screen, wherever you are. When you’re planning a trip, it’s easy enough to find out what roads you need to take, but what if there’s a hidden entrance or a missing sign? By using Google Maps, and then looking at the Street View for your route, you can see landmarks and other useful details that no road map would ever show you. It’s like taking a practice drive before you have to do it for real, and can help prevent frustrating mistakes. In order to decide where to visit, get a preview of a museum’s collections at the Google Art Project site. Walk through the galleries and see what sorts of art and sculpture are on view, then decide if you want to visit. Students can use the art project’s views to find out more about different artists or specific pieces of art, to help with projects or to study techniques to try on their own. Street View: Go to Google Maps and type in the address of a location near you that you know well. 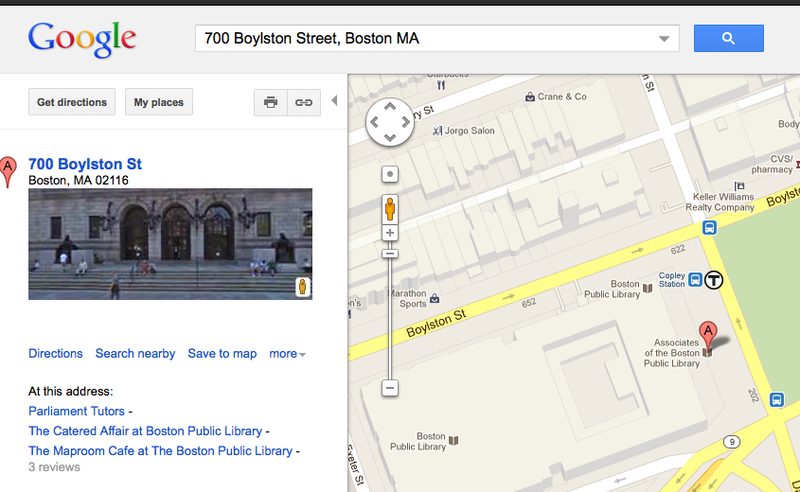 (Or, take a look at the Boston Public Library’s Copley Square location) Once you’ve found your location on the map, click on the icon of the little orange person on the left and drag it to a street on your map. 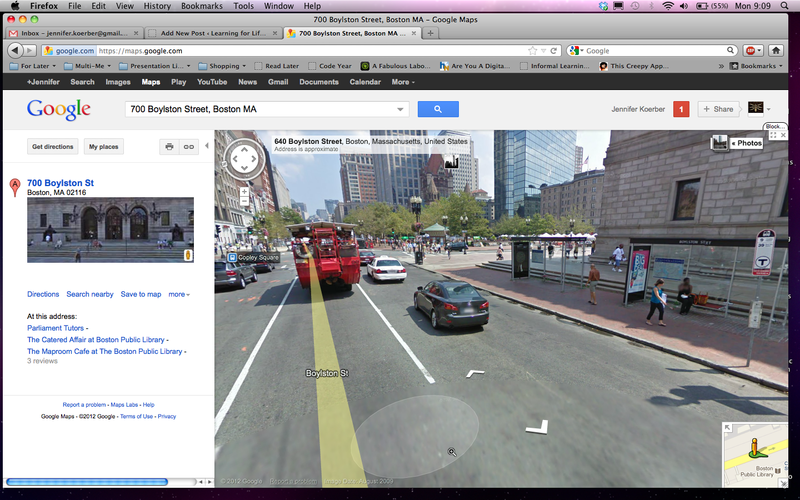 That activates the Street View, and you’ll see what that section of street looks like. Click on the white arrows at the bottom of the screen to move forward and backwards, right and left. Click and drag the image to “turn” the camera and see what’s around you. 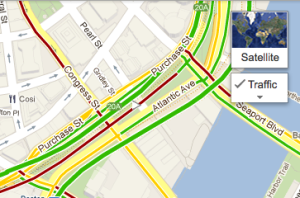 Use the small street map in the lower right corner to keep track of where you are. You can also use the circle at the top left of the map to look around – just click on the arrows or grab the N (for North) and drag it around the circle to change direction. Art Project: Go to the Art Project website and just start exploring. You can click on Collections, Artists, or Artworks up at the top left to view all of the images, organized differently, or you can click on that little orange person in the top left to only see the museums that have Museum View available. Try out the Museum of Modern Art (MOMA) in New York City and walk around its galleries for a while. Again, click on the arrows to move forward and backwards, and click and drag on the image to see what’s around you. Use the icons on the left side of the screen to discover more art similar to the piece you’ve found, to add an image to your own gallery, to share what you’ve found out to social media, and to view a slideshow of art in the collection you’re in. Click on the plus sign on any piece of art to find out more about it, or click on the word Details. This entry was posted in This Week on LLO, Tools and tagged finding stuff online, google, google art project, google maps, google street view, maps, surprisingly useful tools on May 28, 2012 by Jennifer Koerber. Out in the wild world online, getting help using a particular tool is often up to you. However, using help centers, support pages, live chat, and discussion forums, there are many ways to figure out how to make things work the way you want them to. These suggestions are good for using online tools, but also for using the help resources available online for home & personal electronics, appliances, tools, and other gadgets we use. Where’s the link? — The link for a site’s help section is usually in the upper right or lower right corner. Sometimes, it might be along the bottom edge (with links to About Us, Contact Us, etc.) or very occasionally in the regular menus at the top or left. The link to the help section is frequently near the links to the account settings, which we found last week. On the site’s home page, take a look for links to Help, Help Center, Support, Support Center, Customer Care, Getting Started, or Frequently Asked Questions (FAQ). A site might use any of these to link to their help section. 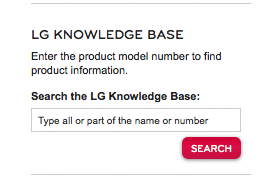 If you see the words “Knowledge Base,” that’s a fancy way of describing a way to search by a product name or number to find information about that one thing. What will I find in the help section? The first way that a website usually offers help is through a Getting Started or Setting Up Your Account page. These pages give you step-by-step instructions for creating an account, changing the settings, and learning the basics of using the site. Many sites include a video that shows you how things work in real-life. After you’ve used the site for a bit, you probably have a few questions. So do many people, and websites usually have a list of Frequently Asked Questions to offer answers. As the title suggests, these are questions frequently asked about how to use a site or tool, and often include problems that users frequently run into. Each question is answered briefly, with examples or screenshots when needed, and occasionally by linking to another section. While you’re there, take a look to see if the site offers tutorials, training or other suggestions for learning how to use a site or a real-world gadget. For examples, see Microsoft Office training and DIY videos from Home Depot and Lowe’s. In most help sections, there’s a search field just for the help section. When you’re searching Help, try to use the same words to describe things that the site or tool does. If you need help on Facebook Pages, type “facebook pages” into the search field. Be specific, and use just a word or two to get started. Finally, some larger companies will offer live chat with a support person through their help pages. If you’d prefer to talk to a real person, at any point, try turning it on and asking your question. When you’re using chat, you don’t have to worry about misunderstanding what someone says on the phone, and you can occasionally save the chat for later. If I Can’t Answer My Question There, What Next? Search the web, especially if you have a strange error code. Copy the error code and paste it into a search engine like Google or Bing – make sure you include the software you’re using or the website you were on. Then click search. Read through the results list and look for words like answers, forum or discussion. These indicate places where people go to talk about software and technology, and often ask each other questions to get help that way. Also, look to see if anyone else has had the same problem and written about their solution somewhere, in a blog or Facebook post. Use discussion forums to ask your question and get answers. If you’re really getting stumped, look on the service or tool’s website for customer discussion forums, or look for other ones online using a search. These forums are places where users get to ask questions, search to see if someone else has already asked their question, and hopefully get some useful answers. Take a look at any of the Google product forums or Apple product communities for an idea of how these work. If you have a blog or a Facebook account, post your question where other people can see it. Again, other people might have had the same problem and might have found a solution for it. You never know until you ask, right? This entry was posted in Basics, This Week on LLO, Tips for Living Life Online and tagged everyday things, finding stuff online, life online, online accounts, online resources, read the screen on April 24, 2012 by Jennifer Koerber. When you’re using online tools, you almost always have to create an account by entering your email address, creating a username, and choosing a password. Sometimes it will ask for more information, but typically, you sign up and then you’re off and running. I suggest that before you start posting or adding status updates, take a little while to look at and understand the settings for your new account. Last week we looked at all of Facebook’s security settings; this week, let’s look at basic account settings for any type of tool. Account settings vary depending on what tool you’re using. 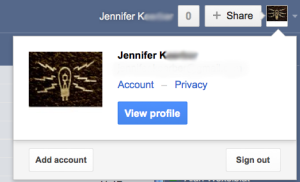 Facebook will have different settings than Gmail or Pinterest because each tool does different things. The settings on your oven aren’t the same as settings on the television, right? Same thing with online tools. If there are more account settings than these, take your time and click on each setting area to read through them and understand them. You might be amazed at how much easier it is to use the tool or service once you’ve customized the settings to work best for you! 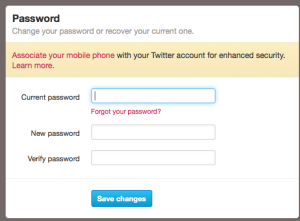 Sometimes, the hardest part about changing account settings is finding them! 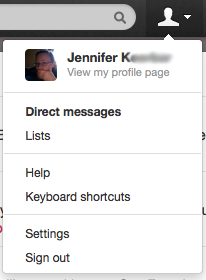 For most tools, whatever you click on to get to the settings area is in the upper right part of the screen. However, what it says or looks like can be very different from tool to tool. By using icons instead of words, the tool is being more friendly to their users around the world. This is probably the easiest part. 99% of the time, changing a settings is as easy as clicking on Edit, typing something in or ticking/unticking a checkbox, and then clicking on Save. For some more advanced settings, you might need to find and enter information from some other account somewhere, but for the most part it’s click and save. For help with the settings for the online tool you’re using, the best resource is the Help or Support section for that tool. Next week on Learning for Life Online, we’ll look at how to find and use the Help and Support sections for many online tools, and how to find answers to your questions elsewhere as well. This entry was posted in Basics, This Week on LLO, Tips for Living Life Online and tagged account.settings, finding stuff online, life online, online accounts, read the screen on April 16, 2012 by Jennifer Koerber. One of the hottest new tools for sharing online is Pinterest. It takes everything we’ve seen about sharing so far and makes it all visual. Pinterest is based on an old-fashioned pinboard, used by designers and artists and anyone who works with images. You ‘pin’ images you like to your Pinterest page and organize them into whatever groups you like. Then, the images are always available for you to see and for others to discover. Since it focuses on images, Pinterest is good for any project or subject that is visual. Redecorating the house, planning a wedding or party, improving your wardrobe, planning travel, organizing recipes – if it’s got a picture, Pinterest is a good way to compare and keep track of it. Imagine you’re decorating a room. As you visit websites and choose paint, pick furniture and find snazzy storage, you can pin pictures of what you like to your Pinterest board. Then, take a look at your board and see what you think of it all together. Or, you’re a student writing a term paper on the history of another country. You need to create a visual presentation to go along with your paper, and you can use Pinterest to keep track of all the images you find while you’re doing your research. Then, when you’re ready to make your presentation, visit your pinboard and pick the pictures that work best together. Remember to give credit to the websites or photographers you got your images from! This is what it can mean to live life online – everything is at your fingertips, ready to discover and compare. Fun, yes? The best way to understand Pinterest is to browse through other people’s pinboards. Visit Pinterest.com and start looking around for things that interest you. See how other users have chosen and organized their pins, and what sorts of things work best for pinning. Then, if you want to, sign up to get an invite to Pinterest. It’s still a new tool, and you need an invite to set up an account. 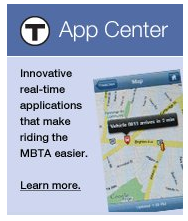 Don’t worry, they’ll give you one – they want people to use it! When you get the invitation, follow the link they give you to create your account. Once you’ve got your account, you can either add the Pin It! button to your browser’s toolbar (scroll up on the page for the button) or, if you have an iPhone, get the Pinterest app from the App Store. Then, whenever you find an image you want to add to your pinboard, you just click Pin It! and you’re done – move on to the next one. This entry was posted in This Week on LLO, Tools and tagged finding stuff online, job resources, pinterest, surprisingly useful tools on March 19, 2012 by Jennifer Koerber. While we’re on the topic of finding things online, let’s look at some of the better job and career resources out there. From mechanic to teacher to nurse’s aid to architect, there are employment resources and job finding sites for every career. Job ads sites just have job listings – an online classifieds section. Career resources may have some job listings, but they’re mostly there to help you with the skills of finding a job: writing resumes & cover letters, interviewing, networking and more. Combination sites have lots of job listings and some skill-building resources, especially resume and cover letter tips. Each type of site is useful, depending on where you are in your career and what your needs are right now. These online classifieds will give you tons of possible opportunities…and that’s it. Craigslist.org – one of the most well-known places to find local job listings. 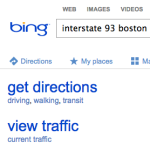 There’s a special Craigslist for cities around the world, such as boston.craigslist.org. You can also find volunteer opportunities, internships and other non-primary employment listings. Online newspapers – Most major newspapers have an online version and they still have their job classifieds. Simply Hired – a new database of job listings, they also have average salary and job trend information. Indeed.com looks and works like Google search, extremely simple to use and to save search alerts to be sent to your email. USAJobs.gov is the official US government site for Federal jobs and employment information. You can also look for job listings from organizations and associations. LISjobs is a national library job listing site; HCareers (Hospitality Works) covers any hotel or hospitality field, including cruise ships and resorts. Different kinds of careers and fields have their own sites, like CoolWorks.com (“Jobs in Great Places”). Use a search engine to find sites for the jobs you’re looking for. Monster.com has recently expanded their Career Tools section. Also, they let you upload your resume and post it, so employers can find you. Career Builder has all the basics, and special resource sections on topics like fraud protection and employment rights. US.jobs from the National Labor Exchange has thousands of listings, but check out their information on relocation and their salary calculator. They also suggest resources for specific Areas of Interest, like Seniors, Veterans and Students. LinkedIn is a social network for professionals. It’s one way you can develop the connections you need to get recommendations and find jobs using those personal links. About.com Job Search offers articles and resources for every part of the job search, from listings to acceptance letters. Your local public library has many books, DVDs and online resources available to help you in your job search, and they may offer resume writing and interviewing workshops. One of those resources may be Career Transitions, a career resources database that uses Indeed.com to find job listings as well. If your library has Career Transitions, definitely check out the Interview Simulator, where you answer questions and get feedback about your answers. If you’re not looking to find a new job, but to hire folks into your jobs, nearly every single one of these resources has something for you. Check out the listings sites for tips on getting good applicants using their site, and the career resources sites for thoughts on retaining good employees. This entry was posted in Resources, This Week on LLO, Tips for Living Life Online and tagged about.com, career transitions, careerbuilder, coolworks.com, craigslist, employers, finding stuff online, fraud protection, hcareers.com, indeed.com, job resources, job seekers, library databases, library resources, linkedin, LISjobs, monster.com, newspapers, online library catalog, searching, simplyhired, us.jobs, usajobs.gov on March 12, 2012 by Jennifer Koerber.